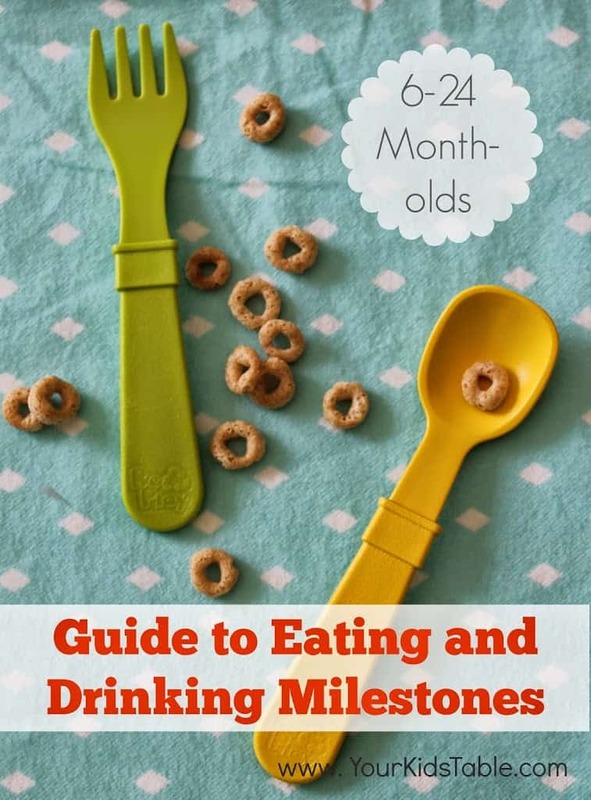 Your ultimate to guide to feeding milestones for babies and toddlers, month-by-month from a pediatric occupational therapist and mom. I probably should have written this post years ago, as a resource for parents, but I have to admit I’ve been a bit hesitant. Each child develops so uniquely and just because they may be late hitting a milestone, it doesn’t necessarily mean there is cause for alarm. For various reasons, it isn’t unusual for a child to be a little late with mastering a new skill. I would encourage you not to use this as a checklist, but as a guide for what types of things you should be looking for your child to be doing next. I will be going over all areas of feeding, from when your bambino should be feeding themselves, to how and when they should be chewing foods. These milestones are based on my education and professional opinion as a pediatric occupational therapist. Please remember that if your child was born prematurely or has a diagnosis, these milestones are likely to be later. *I have provided links throughout to previous posts/articles which outline the particular milestone in detail with strategies to help your child achieve that particular skill. Baby’s eat very often during this time, especially breast fed babies. Meals can be as close as 1.5 hours apart early in infancy and move to 2-3 hours apart as they get older. Get tips for helping babies with acid reflux. Learn how to get a breastfed baby to take a bottle. Find out how to handle your baby gagging on a bottle. 4-6 Months: Starts to accept pureed baby foods and cereals. It is important not to rush this even though it can be very exciting to start feeding your baby. Some signs that your baby is ready is that they are able to sit up in their high chair without being reclined (never spoon feed in a reclined position as in a car seat), they seem interested in what you are eating, and opening their mouth for a spoon. Although I don’t want you to rush this, it is important that you start by 7 months, if you child doesn’t seem ready, definitely talk about it with your pediatrician. 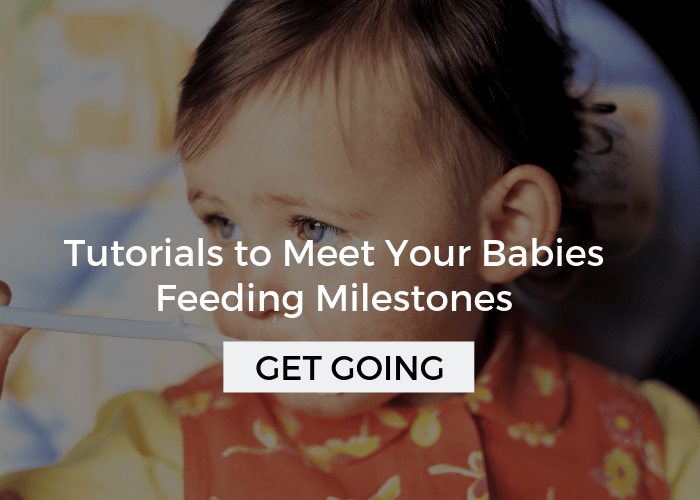 Get a full tutorial on how to give your baby their first meal. 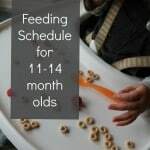 Get a feeding schedule for 6-7 month olds. Learn How to Make Your Own Baby Food. 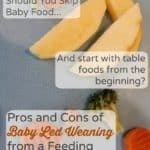 Are you considering Baby Led Weaning (BLW)? Get the Pros and Cons of BLW. 6-8 Months: Drinks sips from a sippy cup. If you’ve read some of my other posts, you know that I’m not the biggest fan of the sippy cup (find out why in the link further down under straw drinking), but it may have a time and a place. Offering the sippy cup at meals in this age range is a good idea because it helps them associate drinking from something other than the bottle. Two of my kids used a sippy cup for a short time around this age, and drank water from it. 6-12 Months: Drinks from an open cup with help. Drinking from a small open cup is a wonderful skill for a baby to learn, although many parents don’t think to try because it is so messy and seems a bit advanced. At first, parents will hold a small plastic cup and try some small sips. If your baby is coughing and choking a lot they probably aren’t ready, but some occasional coughing is normal. Find a tutorial on how to teach your baby to drink from an open cup here (scroll to the middle of the post to find it). While many babies wean from a pacifier on their own or hold onto it for dear life through toddler-hood, you may want to consider pacifier weaning now because it may be the easiest time to transition off of that binky. Get a step by step guide for how and when to get rid of the binky. 7-9 Months: Begins to accept table foods and chews foods with an up/down motion. Babies will munch up and down on those first finger foods. Some gagging and coughing is normal. If it happens excessively, take your time and push back trying a bit. If you are getting towards the 10-11 month mark with no progress, I highly recommend talking to your doctor or looking into an eval (see more info on this at the end of the post). 8-11 Months: Uses a pincer grasp to pick up table foods. Babies will first use their whole hand to pick up foods and then, within this time frame, they will begin to use their index finger and thumb to pick up individual pieces of food more efficiently. 9-18 months: Drinks from a straw. It may sound shocking that a baby is able to drink from a straw, but they are capable of learning. Read How to Teach Your Baby to Drink from a Straw for more details on the how to teach your child to drink from a straw, as well as the benefits of straw drinking. 9-12 Months: No longer uses a pacifier. Okay so this isn’t exactly feeding related, but I often get this question so I wanted to add it here. Obviously, a lot of kids go past this marker, but if you take it away in this time frame, the transition is often easier and you decrease the risk of cavities and malformed dentition. 11-14 Months: Able to take bites from larger pieces of food such as a soft cookie. 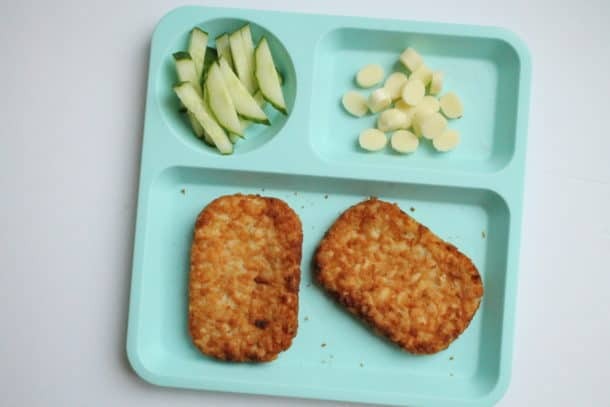 Even though your child may be able to take bites, there will likely be many foods that will need to be cut up in bite sized pieces for the next 3-6 months. 11-15 months: Chews a variety of foods using a rotary chew. Unless you are looking for this you may miss it, but it is an important milestone because rotary chewing is needed for harder foods and more efficient chewing. You will notice your child’s jaw moving in a circular motion instead of just up and down. 11-13 Months: Weaned from baby food. It can be difficult to let go of the security that baby food brings, but if your child is doing well with table foods it is time to let it go! Get a Guide to Toddler Portion Sizes here if you’re worried about how much your baby is eating. 11-15 Months: Weaned from a bottle. Many kids go way past this range, but this is what the American Academy of Pediatrics recommends for a variety of reasons. If you’re breastfeeding there are no recommendations for stopping particularly, but the AAP recommends nursing for 1 year and the World Health Organization recommends at least 2 years. Obviously, this is a personal decision. Read about how, when, and why in How to Wean Baby from Bottle. Read about Stopping Breastfeeding if you’re ready (or pin it for later). 12-18 Months: Drinks from an open cup independently. Again, this really depends on how much opportunity the child has been given to practice. Although it can be messy, trying an open cup a few times a week while your child is in the high chair will promote his eating and speech skills. 15-24 Months: Uses spoon and fork to independently feed themselves. Toddlers may be using a spoon before this age if they have been given an ample chance to practice. However, they may not be proficient and need some occasional help. This skill has a wide age range because some parents would like to avoid the messy eating and hold off on trying until they are a bit older. By 2 years, kids should be totally independent in feeding themselves. Get the guide to your child’s Self-Feeding and learn how to help them learn to use utensils and their fingers to eat. 24+ Months: Can safely eat all foods. 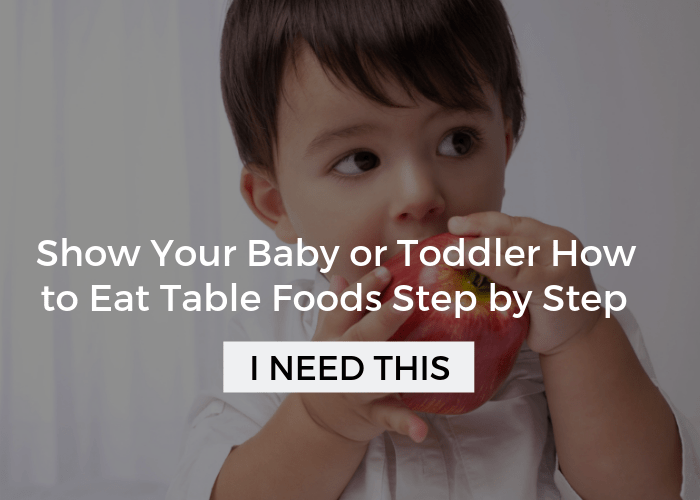 By 24 months, most toddlers will be able to manage any type food. Of course, you will still want to avoid obvious choking hazards such as whole grapes, popcorn, and whole hot dogs. 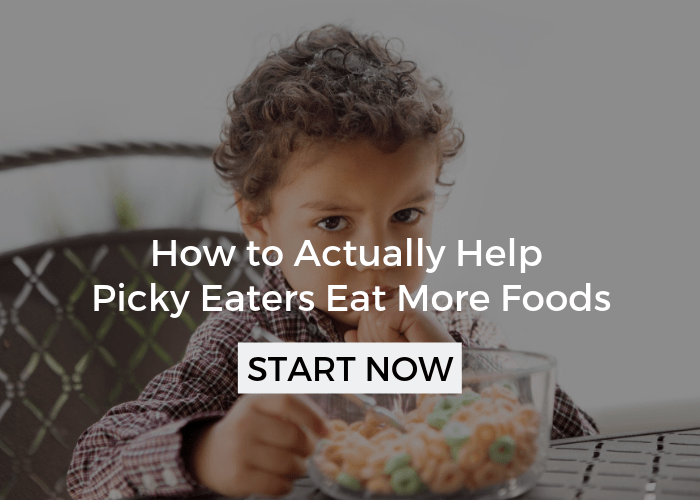 Get a plan to prevent the Picky Eater Toddler in your home. I can’t tell you how many families over the years I’ve helped that had picky eating begin around 1-2 years of age. While that’s normal, it isn’t for it to continue past 4-5 years of age. 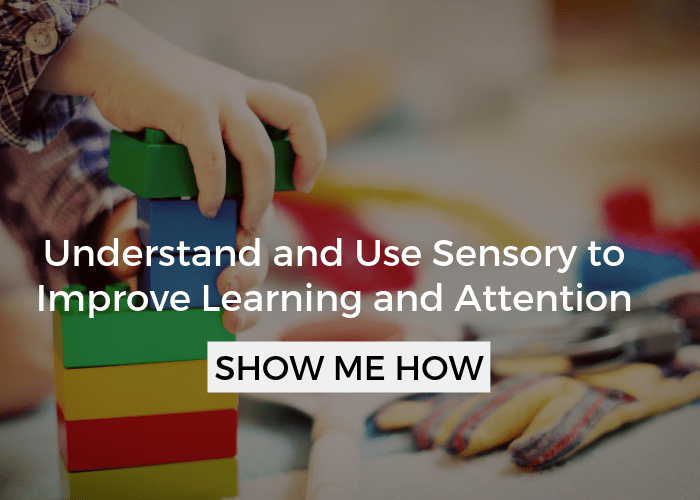 This plan will give you the tools you need to keep your toddler on track. If it seems your child is very far behind on several of these milestones and/or your instincts are telling you that you need some help, than by all means talk to your child’s doctor. 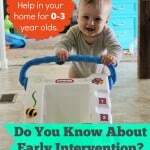 If you aren’t comfortable with the answer they give you or you are ready to get some definitive answers, then I would encourage you to schedule a free in-state (need to live in the USA for this) early intervention evaluation that is completed in your home, or set up a private evaluation through your local children’s hospital, outpatient facilities, or private clinic. With the latter, contact your insurance ahead of time to make sure you understand everything that is covered. I’ve got one for you! Get How to Improve Your Child’s Eating in 9 Steps. 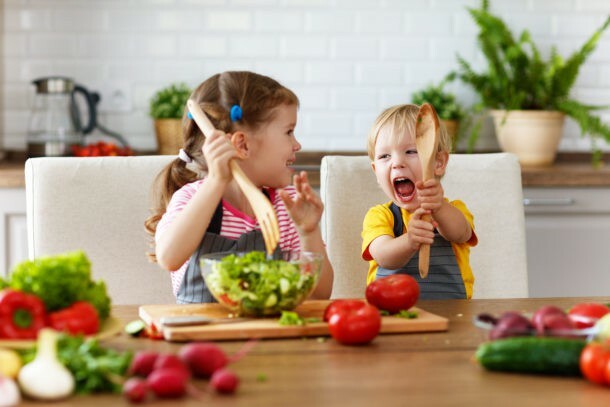 This simple, but essential guide will give you my tips for raising kids to have a healthy eating habits. Get it with your email below and I’ll send it right to your inbox. Don’t forget, you might want to check it out again! my son is 10 months. he not a big eater i ve tried puree, mashed and finger food. he takes the first few bited open his mouth even feed himself . but never ate more than few bites. ( max 1 table spoon banana or yougurt) he wants to be breastfed after eating. he doesn t take the bottle. we ve been using the straw cup with water. he mostly play with it drink to much and cough. how can i put him on a schedule and increase his feeding. note i m gonna go back to work in a couple of months. I’d definitely head to how to transition to table foods, this gives some clear and concrete steps that I think will be really helpful, but I’d also mention this to your doctor, he may benefit from some feeding therapy or a little more help. Any suggestions for syringe dependent 1 year old? My 1 year old will drink milk only from syringe and distraction. He will sip straw sippy cup here and there for milk but totally refuse bottle at this time. He will eat some puree but usually refuses most textured food. If you haven’t already, I’d definitely look into a feeding evaluation, it sounds like there could be some underlying difficulties going on. 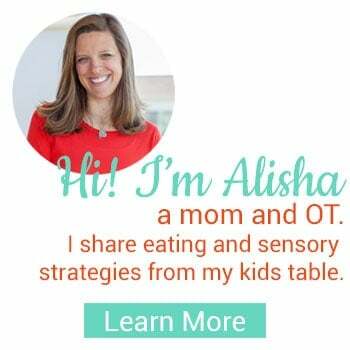 I’d look at this post on why kids refuse to eat, I’m wondering if there’s an oral motor or sensory component (you’ll find links for specific strategies to help you with both inside that post). Hi! So my daughter loves the same foods my husband and I eat but she insists on us feeding her. She screams and cries every time we try to help her guide food to her mouth. Any tips? She is 9 no old btw! That can be tricky, she’s still a little on the young side, so I wouldn’t worry too much yet, but I do have this post on teaching babies to self feed that I think will be perfect for you! Thank you for your post. It has been very enlightening. My 18 month old son throws up quite often since October 2017. We have taken him to the gastroenterologist and did a x-ray exam with contrarst and thankfully nothing came up. Since he goes to daycare, he gets sick with mucus, which we have thought that the flem might be the cause of the throw ups. However he is currently mucus free and has thrown up the last two days when he is eating. Hence the reason I’m writing to you. The food he was eating was chopped up grilled chicken into tiny pieces. He can eat “mushes”really well on his own with his spoon and dislikes to be helped. So we make “smashed” vegetables and mix them with chunks of chicken or meat and no problem. However, “loose” food cause the coughing most of the time but not everytime he throws up. Rice, chicken, or pasta with little sauce are other examples. Keep in mind he has thrown up in the past after drinking his bottle, so not every instance is related to tiny pieces of food. Based on the little information provided, do you believe this situation might be related to him not knowing how to chew properly? Should I get an evaluation? Thank you again for your willingness to serve. Much appreciated in times of desperation. It’s definitely possible that could be related to his chewing, and I would recommend getting an evaluation. Hi I just found your site. My daughter is nearly 16 months and will not eat table food. She’s been slow to start on a number of things. For example, she was slow to roll over, slow to crawl, slow to accept purees and is just now pulling herself up to her knees using the sofa. However, it seems like once she sees a reason behind something, such as crawling gets her closer to her toys, she goes like gang busters. She went from crawling a few feet to scampering all over the house in about two weeks. When it comes to table food or purees with small chunks, she’s not interested. Any puffs or yogurt melts on her tray are immediately picked up and dropped on the floor. Any cut up table food gets the same treatment. Crackers, graham crackers, etc. all end up on the floor. She also doesn’t really chew on her toys. Although, she will chew the entire spine off a board book and then start on the edges of the book, if you let her. If you try to place table food in her mouth with either your fingers or a spoon, she refuses to open her mouth and throws a fit. She used to do this with puréed food to until magically one day, at about 10 months, she decided she was okay with purees and now eats just about anything puréed, unless it has chunks. She also knows how to use a sippy cup, but thinks of it as more of a toy than something to drink fluids out of. Her doctor is a little concerned about her not eating table foods at this point, but doesn’t see anything physically wrong with her. She suggested a consult with an early childhood development specialist. Honestly, I think she’s just inherited a stubborn streak from both of her parents and will start eating table foods when she decides she wants to. Love all of your articles! My daughter just turned 15 months and is currently eating just about everything you can think of. However, I am having issues getting her to eat things from a utensil versus something she can hold in her hand. For example, she will eat chicken that she can pick up and clean the plate versus oatmeal which has to be given with a utensil. any suggestions on what to do for this? She also has all of her teeth so chewing is no issue. What if my 8 month old doesn’t have any teeth? I know this sounds silly, but can I give him non-baby food? I’m not sold on baby led eating. What are your thoughts? Oh yes, teeth don’t matter unless you’re eating food as tough as steak. You’d be surprised at how tough their gums are. When they get teeth their in the front anyways and those aren’t used to chew. I have a whole post on my thoughts on BLW, check it out here. I am loving this site and your meal ideas. I’ve saved several of your printables. Thank you! My 11 month old is not a big eater, but is pretty open to trying new finger foods (she’ll at least take a couple bites). But she does not self-feed at all – I have to put the food in her mouth for her. I won’t bother listing all the things I’ve tried in getting her to self-feed – I feel like I’ve tried everything, with no success. She does not put toys in her mouth either. She’s maybe done it a handful of times. She does not hold her own bottle to feed herself, and will not take a sippy cup at all. Every time I’ve tried to get advice, I’m told to keep waiting; she’ll get it eventually. I sure hope that’s true. But I am wondering if an eval might be worthwhile. Awww, thanks, I’m so glad! First, keep in mind she’s still really young for self feeding, we want her to be moving in this direction, but she has a little time. It’s more of a red flag to me that she doesn’t put toys in her mouth, and this actually could impact her eating. I’m not a fan of wait and see, I’d trust your instincts and get an eval, if you’re in the states you can get one for free. It’s really easy and can be an awesome service. I also have this post if you haven’t seen it on self feeding. Thank you for your article. I want to clarify something. The AAP recommends breastfeeding for a year and then as long as it is mutually desirable for the mom and baby. Your post makes it sound like they only recommend a year which is not the case. Thank you. My son just turned two and he is still at the beginning stages of using a spoon and fork (he can handle using for a few bites and then eats rest of meal with hands or my assistance). After reading your site, I realize that even now he does not have much of a pincer grip (does the grabbing huge fistfuls and shoving in his mouth). He did not like purees so we skipped that and went to whole foods around 8 months (his choice). He had a really hard time with sippy cups and staws- not drinking independently until over one. He was not a great eater (always just at minimum weight to not be concerned) until we figured out he had asthma/breathing challenges at age one. Once medicated his interest in food picked up tremendously and he is now at the higher end of the scale for his age/size. He also started walking and saying words about a month after (which he seemed also a little behind other kids on, not even crawling until a year). I am wondering is he just behind because of the breathing stuff and he’ll catch up or are there things we should do to help him more? Also, have you ever met with a nutritionist? Is that possible? To get her on a possible supplement. My son is about to turn 8 months old and we’ve been trying to get him to try more solid food. He will eat any kind of puréed food, no problem. But I’ve started off by giving him Gerber puffs (even pieces of puffs) and he gags and then even threw up one time. I’m a first time mom so I’m just worried that something is wrong in the fact that he won’t even eat a puff. We put the food (puffed, mashed up pieces of bananas) on his tray but sometimes he will even cry when we help him put the pieces of banana or pieces of the puff in his mouth. What can I do? I’m so worried something is wrong. Oh yes, I’m sure they are! Outside of switching to other bottles, the only thing I would do is have him help you or prop up a little support under it, like a little pillow or stuff a blanket to help keep the weight off. He probably just hasn’t had enough practice with the sippy cup. Practice a couple times of day for the next week or two and let me know if you don’t see any progress. I really needed this, because I was worried about my son’s skill to drink from a cup independently and self feeding with a spoon (hey, who needs a spoon for oatmeal, when you’ve got two hands???). Turns out, we are doing fine! What would be the size of an open cup that you would recommend for a 16 month old? Start off small, if you are just beginning. The size of a dixie cup is great, but a little bigger should be fine, too. Our grandson’s dentist who is one of the best pediatric dentists in northern Colorado says that as long as a child is off the pacifier by age 3 it will do no harm to their teeth. Of course I respect your dentists opinion. I can tell you that I have seen children before the age of 3 with their dentition out of alignment- it does depend on how often the child is using the pacifier though. I know people get pretty heated about this issue, but from a development stand point they don’t need it any long past the age of 1- in most cases. Many kids use it much past then and are fine. Being done by 1 is the best case scenario.